Today Xiaomi launched their flagship phone Mi 6 in Beijing China. Mi 6 has a Snapdragon 835 10nm processor that has a 64-bit octa-core CPU, Adreno 540 GPU and 6 Gigabytes of RAM. The screen is a 5.15inch one similar its predecessors and the battery capacity stands at 3350mAh, which provides a day long juice for the phone. Xiaomi Mi 6 is encased in a four-sided curved 3D glass with rounded corners. There is a dual camera setup in the back and a Fingerprint sensor in front home button under the glass. The phone is splash resistant but there is no IP certification given by Xiaomi. The camera setup in the back got highlighted in the unveiling. Two 12 megapixel cameras, with 4 axis OIS for stability, provides 2x optical lossless zoom and 10X digital zoom with ISP algorithm. There is a built in depth-of-field mode available in the phone. The sound system also got an upgrade, which consists of a set of speakers with stereo effect. There is a Silver edition, which equips Four-sided mirror glass and ultra-reflective metallic finish, and a ceramic edition with 128GB storage. 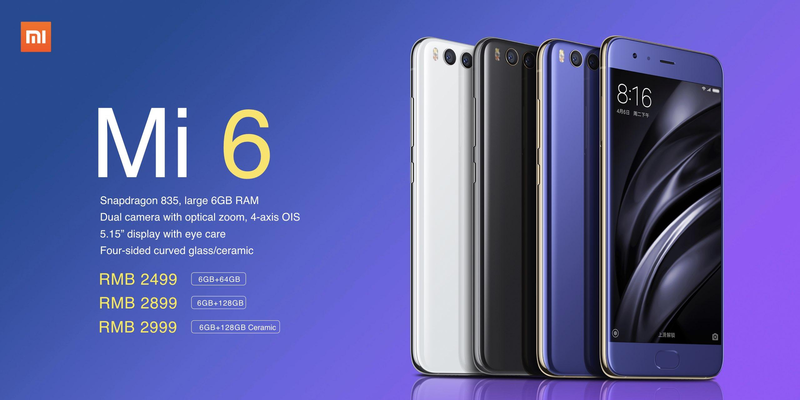 6+64 GB Mi 6 costs 2499 RMB – $360 – BDT and the Mi 6 Ceramic edition is offered in 6GB + 128GB at RMB 2999($435).